Online account access is now available. 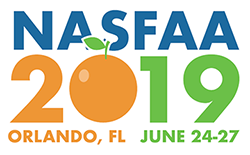 In the User Portal, you can find the information to plan your participation at the NASFAA Annual Conference. You will be able to also access your account to print or to pay invoices and update your company description and your listing for new products and services for both digital and web. April 5 - Deadline to submit Financial Aid Business Solutions (FABS) Seminar and Learning Lounge descriptions. Please use online portal. For other booth-related deadlines including shipping, purchasing electric, carpeting, and internet, please refer to the information in your Exhibitor’s Service Kit found at in your User Portal.